Ernst, a little blue crocodile, loves to ride the carousel in the park. While his favorite wooden animal is the honey-colored dog with the moveable tail that wags, his more pragmatic big brother, Sol, pronounces that the tail is simply loose and should be fixed. When a disappointed Ernst starts kicking a scrap of wood after the carousel has closed for the season, he realizes that the scrap is actually the dog’s tail. With the permission of the carousel keeper, a kind elephant, Ernst decides to care for the tail until spring. He paints a cheery face and glues colorful wings on it, transforming the wood into a fanciful bird. Despite Sol’s admonishments, Ernst revels in making the bird its own carousel and playing with it in the falling snow. Recognizing the boy’s artistry, the carousel keeper lets Ernst keep his handiwork once spring arrives, and together they find an apt replacement for the dog’s tail. Author and illustrator Kleven designs a feast for the eyes with detailed collages, rendered with patterned papers, watercolors, ink, pastels, and colored pencils. Whimsical, brightly colored images swirl across the pages. Readers will linger over the illustrations to savor the details and find such hidden treasures as a reference to Hans Christian Andersen. Following Ernst and The Puddle Pail, this is the third book starring the adorable blue crocodile. 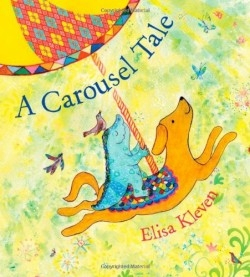 Kleven has produced numerous other books with magical creatures and charming events, such as The Apple Doll, The Paper Princess, and Sun Bread. She has also illustrated multicultural, regional, and inspirational titles, including Abuela, City of Angels: In and Around Los Angeles, and Angels Watching Over Me. Kleven once again allows Ernst to connect to his inner world and build his creativity and independ-ence. In the elephant carousel keeper, he even finds an adult who appreciates and nurtures his artistic spirit. Their delightful story and friendship will en-courage children to develop their own imaginative passions and remind adults to let these inventions soar.